The following was written by Bob Snow following his tour of Syria. 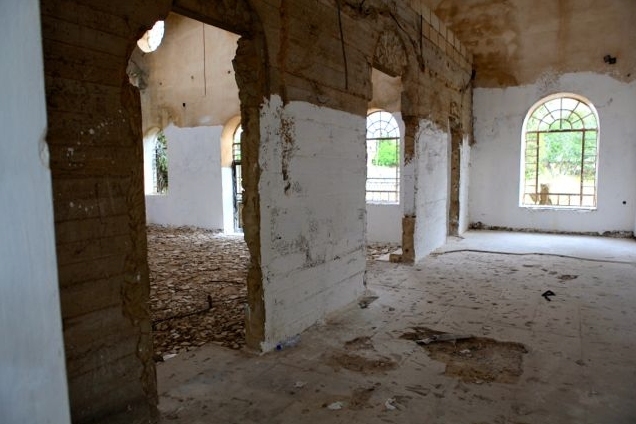 He has travelled extensively throughout Syria, Jordan and Lebanon. Thanks to Bob for letting us publish this article. In 2010 I was travelling around Syria for five weeks as a normal tourist, but also taking high resolution photos for the National Union of Syrian Students. I was doing it as a volunteer and they showed their appreciation in different ways. I was wined and dined at wonderful restaurants atop Mount Qasioun and in the Christian Quarter of Old Damascus. I was also asked if there is anything else I would like them to do. I did not hesitate to ask for a tour to the Golan Heights. They said yes, and it was organised. With a four-wheel drive, a driver, a couple of guides/interpreters and an unspecified extra person, (who probably had some form of security connections), we left for a totally fascinating day. I thank them very much for the chance to have this experience. I know that in recent years many members of the Fiji Military (on UN duties) have a much more harrowing tale to tell of their time in the Golan Heights. Thankfully all of them lived to tell their story. With the chaos in Syria and Israel taking advantage to consolidate their hold on their part of Golan, expect some fireworks over the next year or so. Just what the Middle East does not want. Syria lost part of the Golan Heights to Israel in the 1967 War. Israel tried to formally annex the part that they now control, but the international community has not endorsed this move. 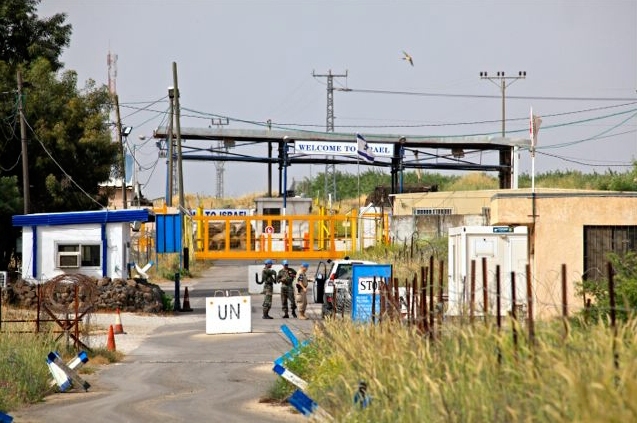 The border between Syria and Israel is monitored by the United Nations. Fiji has been part of this group in recent years. 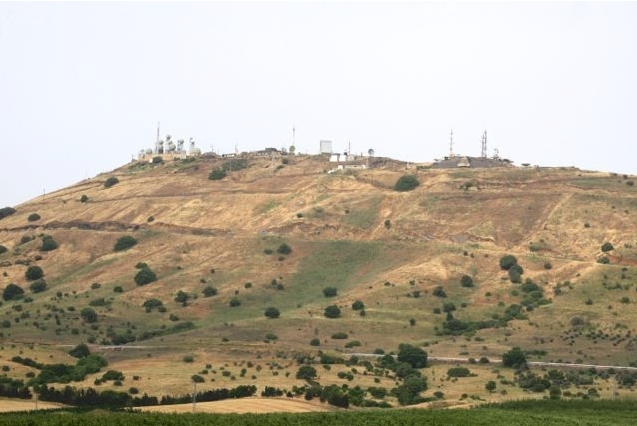 Israel took control of 70% of the Golan Heights, then caused much destruction on the Syrian side. 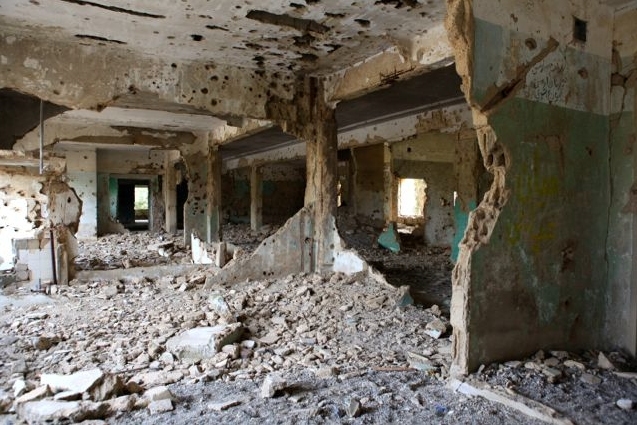 Hospitals, mosques, churches, homes and public buildings were destroyed in many parts of the area, and the main town, Quneitra, suffered considerably. 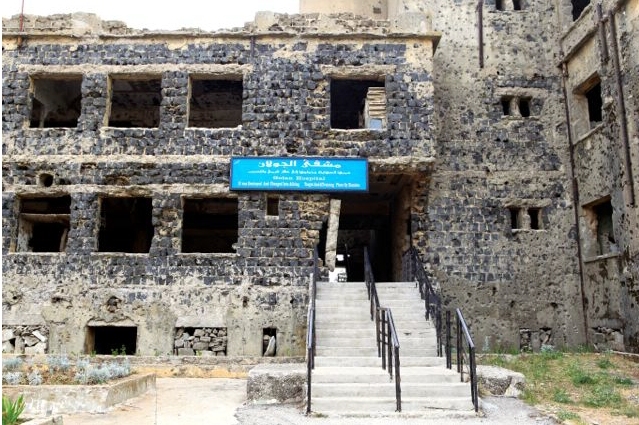 Syria has chosen to leave the destroyed buildings as a "living museum" - a constant reminder to what has happened. Israel is angry that Syria chose not to rebuild the town, as they do not want this constant reminder to be on show for the rest of the world. 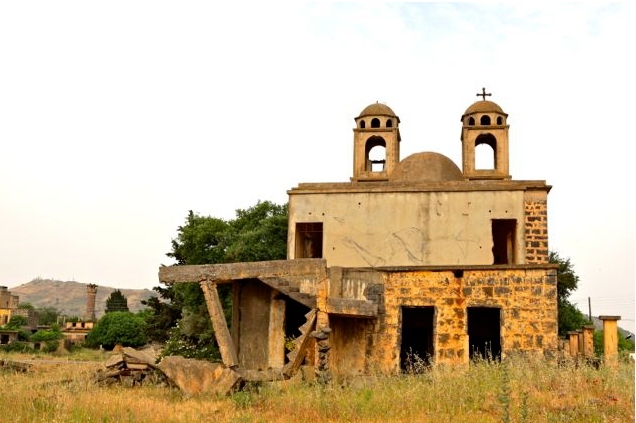 A church in Quneitra, showing the damage sustained. Needless to say mosques suffered the same fate. 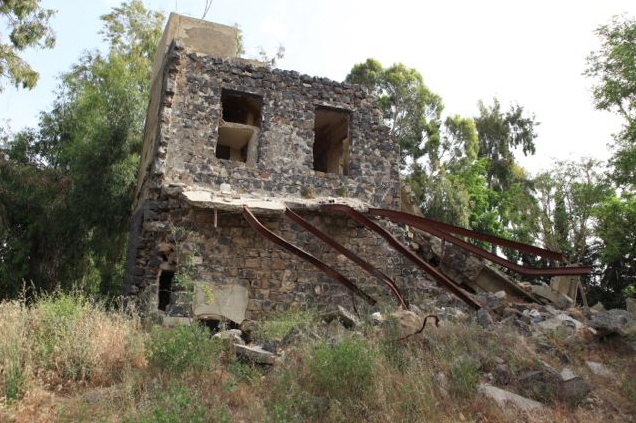 Damage to the Golan Hospital in Quneitra. 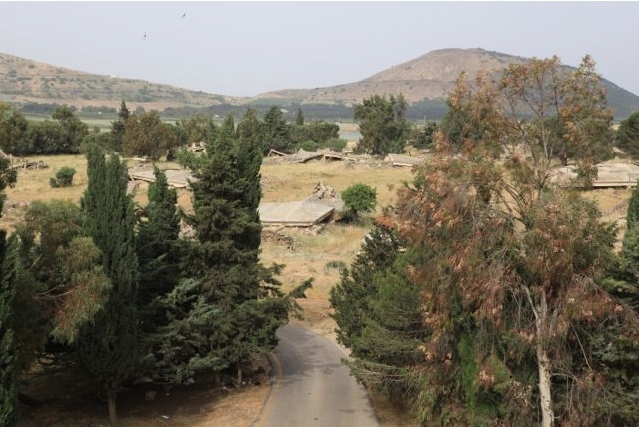 Today the area is abandoned and the new administrative capital of the area has been built at New Quneitra. Below are scenes from the devastated town. Close to the border it was possible to hear rock music blasting out from across the valley where the Israeli soldiers had a nightclub, which was well in operation early morning - presumably for off-duty soldiers. (It is there, nestled in behind the agricultural area). On a hill nearby were important Israeli defence and communications installations. Along another part of the border it was possible to photograph to the Israeli side, and with the telephoto lens be able to see people moving around. In another part of the border it was possible to hear people talking in a loud voice, doors closing and the sound of the tractor . So close - yet so far. Israel destroyed many of the Syrian villages and towns that it captured. Some still remain, however, such as the ones in the photos above. 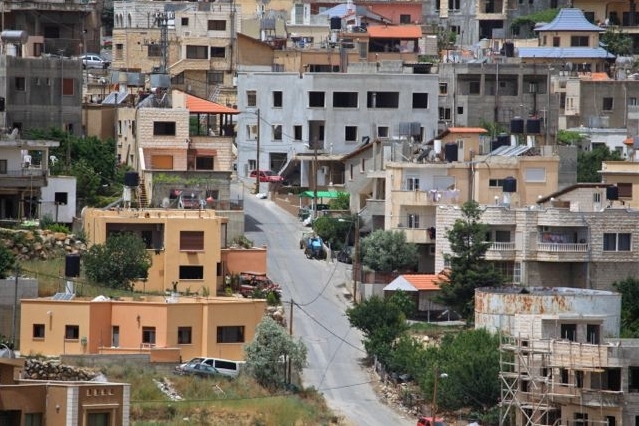 There are several villages that are inhabited by Syrian Druze and they remain fiercely loyal to Syria. 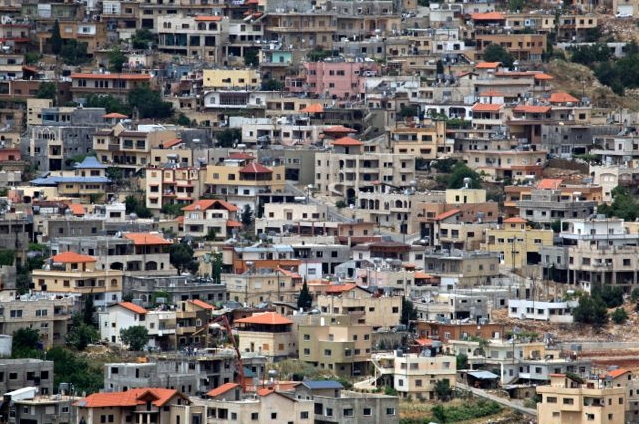 Since the military crisis in Syria Israel has taken the opportunity to build 30 new settlements in their section of the Golan Heights. All of the world's attention and condemnation, has been focused on the illegal settlements on Palestinian land in the West Bank, but by stealth and hiding behind international apathy, they have been just as ruthless in Golan. 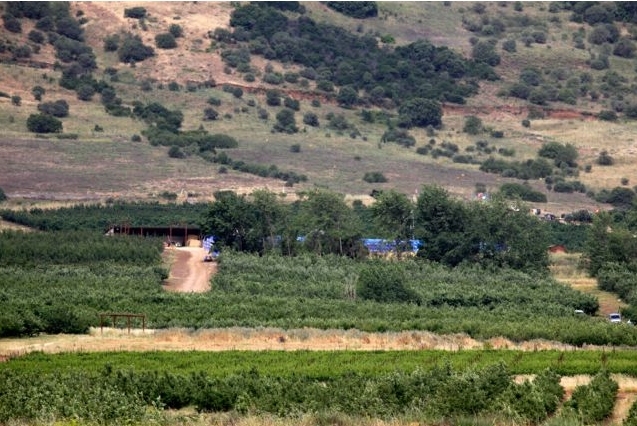 A few years ago the Israelis discovered a significant oil field under their part of Golan. 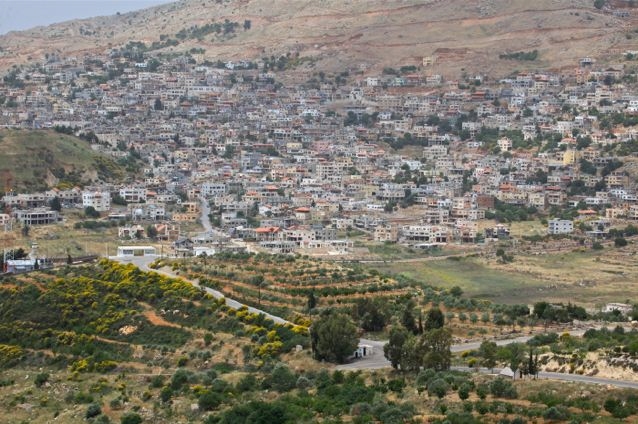 There is no way Syria will get back the Golan now - especially with the support of the US government and power structure in that country which seems to call all of the shots. Sorry Syria - your friends are just not powerful and influential enough. Today, outside of Quneitra, there are many people living on the Syrian side of the Golan Heights. Many of them are Druze. Until recently the Syrians under Israeli occupation were allowed to travel each year to attend university in Syria, but that has all come to an end with the current unrest. The Druze, and others under occupation, are now slowly losing contact with their families the other side of the UN-patrolled border. Many Sunni Syrians in the occupied area support the uprising against al- Assad, but the Druze remain fiercely loyal to him. What minority group would not. Many Druze in Syria have been slaughtered and executed by the religious warriors of the Nusra Front and Islamic State. Most of the residents in the occupied Golan have refused to take out Israeli citizenship, and they are now classified as having an "undefined" citizenship. Morning tea with a Druze family in the Golan Heights. I do not think my interpreter was overly impressed with being included in the photo. I have another photo of her doing some shopping for us. With this Druze gentleman as the last posting for this blog - we bid farewell to the Golan Heights. I thank Ihab Hamed from the National Union of Syrian Students for arranging the trip for me to this little-visited part of the world, and for arranging for me to have great company for the day. Thanks also to the Syrian security officer down on the border with Israel for his hospitality, coffee and chocolates. He has had very few tourists visit him there! One more blog to go. See you then.